Few days ago I posted about a Classic Space keychain, which used a historically inaccurate helmet – the “Minifig, Headgear Helmet Standard” issued 1987 onwards – on a figure that depicts a LEGO astronaut from 1978. The reason for this atrocity obviously being that the “new” 1987 helmet is still in production and used in current sets, while the old 1978 helmet is not. The old helmet was thinner and shaped more conservatively, it also wasn’t as glossy. Let’s forgive, but not forget. Instead, I will use this opportunity to take a closer look at some of the different space-related helmets within the LEGO universe. Introduced in 1978, the classic LEGO Space used what BrickLink calls the Minifig, Headgear Helmet Old with Thin Chinstrap, with or without visor dimples. This helmet, the so called old helmet, went on to become the signature piece for Classic Space most of its near-decade run. Indeed, 1978 was also the year the modern minifigures were first launched – in any theme. Many themes made use of the helmet: Classic Castle combined it with a unique castle visor until the great LEGO Castle revamp of 1984 (see my horse portrait). It was also widely used in LEGO Town, the precursor to today’s LEGO City. The first helmet update came when LEGO introduced a sturdier “Minifig, Headgear Helmet Old with Thick Chinstrap”, which apart from a thicker, slightly protruding chinstrap looked identical. The thick version was used in LEGO Town and Classic Space too, starting around 1986 or so. The exact timeframe is uncertain, some databases place the thick version as far back as 1979, but past experience and further research suggests this is an inaccuracy and mid-1980s is more likely. Set photos from 1986 reveal that both thin and thick versions were sold side by side for a while. In any case, there is no question that an entirely new helmet followed in 1987 when LEGO Futuron/Blacktron started replacing Classic Space. 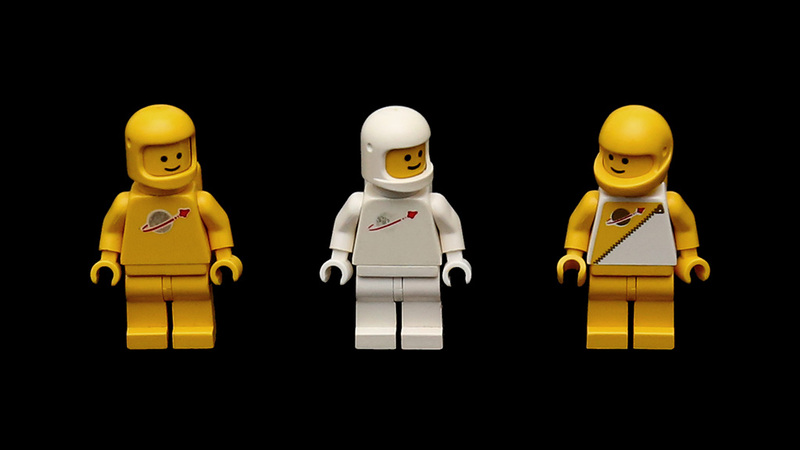 Above: On the left/middle Classic Space minifigures with old helmets (thin and thick chinstraps respectively), on the right a LEGO Futuron minifigure from circa 1987, with the new helmet. Classic Space helmets often had visor dimples, but I don’t remember them having visors – Futuron had visors, though (not pictured). The “new standard helmet” from 1987 became a far longer-lasting piece than its old predecessors, which faded from new LEGO Space and Town sets by 1988, after only a decade of service. 25 years later, the 1987 helmet is still widely used in modern LEGO City sets, especially for pilots and motorcyclists. And curiously enough, it still looks new – like it could be from 2007, not 1987. Even so, LEGO’s actual space themes have moved on to even newer helmets. Licenses are one reason. For example, the LEGO Star Wars theme has naturally introduced many different helmet designs since its launch in 1999. The latest major departure, in my/son’s collection at least, came in 2010. LEGO City’s Space sub-theme introduced us to the new space and spacewalk helmets. The latest helmets are also doubling as alien hunting and underwater gear in other LEGO themes. Unlike LEGO horses, that have become smaller generation to generation, LEGO helmets have actually grown significantly in size over time. Obviously there are many more LEGO Space helmets in existence, see BrickLink search for a good start. As an example, in the noughties LEGO used aviator caps and wild studded headgear in some space sets. But I must pleed the dark ages there. 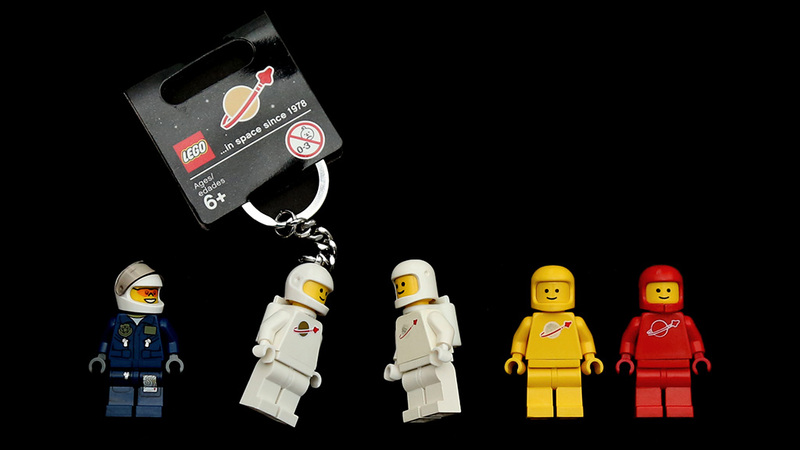 I have a red original 1970’s spaceman keyring given to my brother by a Lego rep’ at a toyshop in York in the 70’s. Any idea of its value?